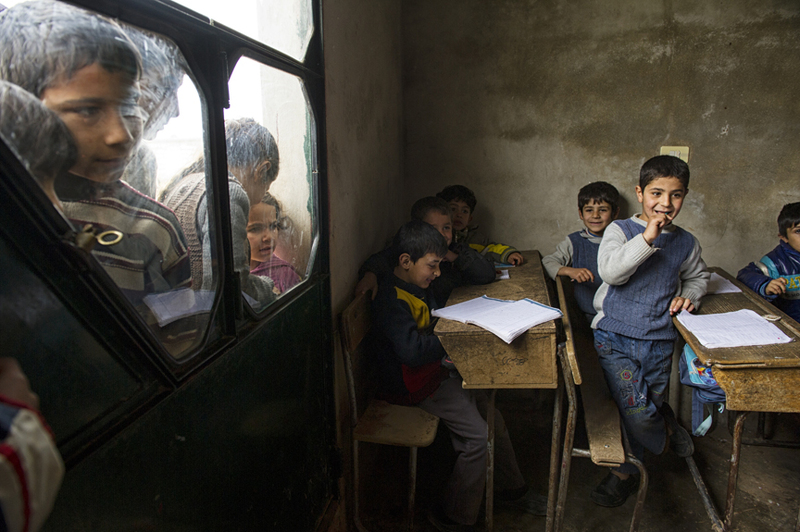 Syrian children go to a small shuttle school, set up for families who were scared to send their children far in the midst of war, in the village of Tlalin, in northern Aleppo province, February 9, 2013. The school is taught by a medical student, whose own studies were cut short because of fighting. The members of the Tlalin council have been working hard in Tlalin to get the town up and running again in the midst of the war. They have recently been able to provide the bakery with flour to make bread, and are working on providing water, electricity, and other facets of infrastructure, while also ensuring there is education for the children and a piecemeal security force. While parts of Aleppo faces constant fighting between regime forces and the Free Syrian Army, there are villages that are trying to build a town council, and help return life back to some semblance of normalcy amidst the war.